How Much House Can Millennials Afford? According to data from the U.S. Census Bureau, millennials (born between 1980 and 2000) are buying homes at a far lower rate than previous generations. The 2015 Q3 homeownership rate for adults under the age of 35 was 35.8%. In 1995 it was 39.1%. In 2005 it was even higher at 43%. While no one can say for sure why this is the case, there are a number of theories. Try SmartAsset’s free home affordability calculator to find out what you can afford. The housing crash may have played a role, changing the perception of homeownership among the younger generation. Lifestyle may also be a factor. Many millennials prefer the flexibility of renting, which makes it easy to pick up and move on short notice. Perhaps the most compelling explanation for the low rate of homeownership among millennials, however, is the simplest. With wages stagnant and the cost of education chipping away at savings, many young people cannot afford to buy a home. To determine the average home price that would be affordable to millennials across the United States, SmartAsset gathered data on the median income and median net worth for Americans under the age of 35. Microhousing. In New York, Los Angeles, San Francisco and Washington, D.C., the typical millennial may only be able to afford a home of less than 300 square feet. Compare that to the nationwide average size of newly-constructed single-family homes: 2,453 square feet in 2014. More house in the Midwest and South. For millennials who want to own their home, the heartland may be a better bet than the coasts. In cities like Houston, San Antonio and Indianapolis, the typical millennial may be able to buy a 1,000 square foot (or larger) home. In Detroit and Memphis, homes of 2,500 feet or more are possible. Our studey shows millennials living in New York City do not have much of a choice when it comes to renting or buying. The city’s high cost of living makes it difficult to accumulate savings – we estimated that the median net worth of millennials living in NYC is just $2,431. At the same time, New York’s housing market is one of the most expensive in the U.S. with an average price per square foot of $415, according to Zillow. The net result? We calculate that the typical millennial in New York could afford to buy a 165 square foot residence. Find out now: Is it better to rent or to buy in your city? The median income for millennials in the LA area is $33,667, according to the U.S. Census Bureau. Applying the HUD-recommended ceiling for debt payments of 36%, that implies the typical millennial in Los Angeles could afford a maximum monthly mortgage payment of $1,010. In Los Angeles, where a three bedroom house costs nearly $800,000 on average, that payment does not go very far. Compared to millennials in the country’s two largest cities, young home owners in Chicago are in a fairly good position. We found that the median home value affordable to millennials in Chicago is $148,000, which could buy a 937 square foot home. Not a mansion by any means, but certainly better than the comparable properties in New York and LA. 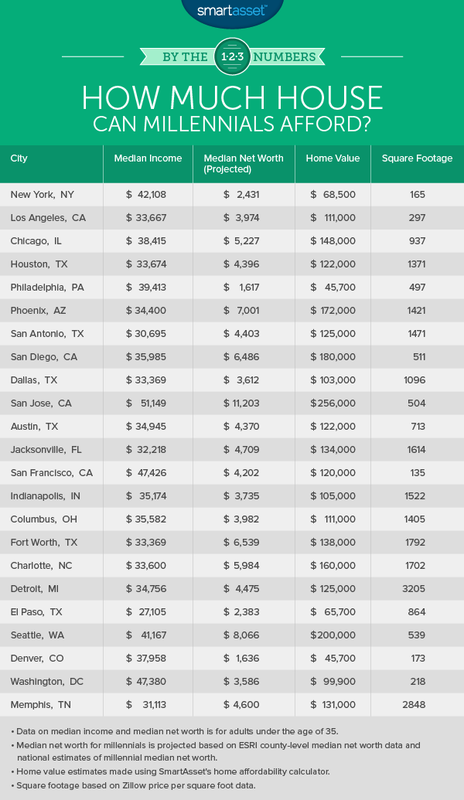 While Houston has been growing more expensive in recent years, it remains far more affordable for millennials than other major American cities. Our analysis found that, based on a median income of $33,674, millennials in the Houston area could afford a 1,371 square foot home on average. A relatively low median net worth in Philadelphia makes it hard for the city’s millennials to pay for a home. The median net worth in the city is less than a quarter the national average. That means many young people in the city may have trouble coming up with a sufficient down payment for a home. Housing is somewhat more affordable in the desert than on the coasts. Our analysis found that millennials in Phoenix could afford, on average, a home worth $172,000. That buys about 1,400 square feet in Phoenix, according to data from Zillow. It is no secret that San Francisco is one of the most expensive cities in the country and growing more so every day. According to SmartAsset’s analysis, millennials in San Francisco can afford a home of just 135 square feet on average. Detroit stands in stark contrast to many of the cities on this list. The average home size affordable to millennials in Detroit is 3,205 square feet, larger than the average home size nationally. Based on the median income and net worth for residents under the age of 35, the average home value affordable to millennials in Seattle is $200,000. That is higher than any other city on the list, but thanks to Seattle’s pricey housing market it does not buy much – just 539 square feet, according to data from Seattle-based Zillow. Located at the edge of the Rocky Mountains, Denver has become a popular destination for young adults who are relocating. It is likely, however, that few of them will be buying a home any time soon. SmartAsset found that the average home value affordable to millennials in the Mile High City is just $45,700. 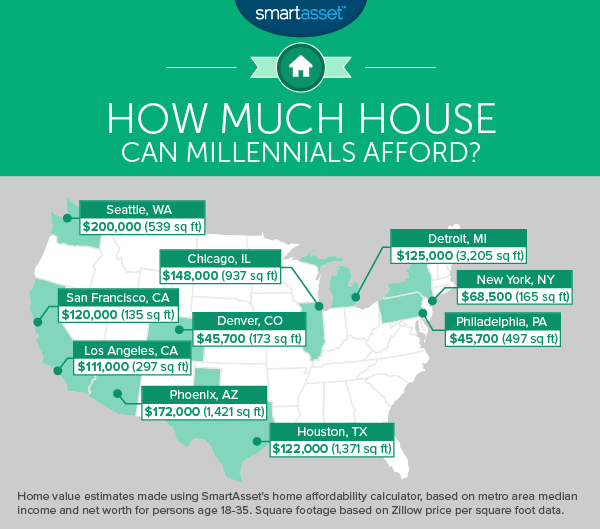 SmartAsset’s analysis of millennials and home affordability considered median income and median net worth for adults under the age of 35 in the largest 23 cities in the U.S. The median income data comes from the U.S. Census Bureau’s “Young Adults, Then and Now” report. To find the median net worth for millennials across the country, we used national net worth data from the U.S. Census Bureau and county-level net worth data from ESRI. We adjusted national data on the net worth of households in which the householder is younger than 35 based on county-level data for the full population. So, for example, if the overall net worth in a given county was 30% higher than the national net worth, we adjusted the national millennial net worth upward by 30%. We then fed the median income and net worth data into our home affordability calculator, which incorporates interest rates and the FHA minimum 3.5% down payment for first time homebuyers. We treated the net worth figure as the down payment on the home. 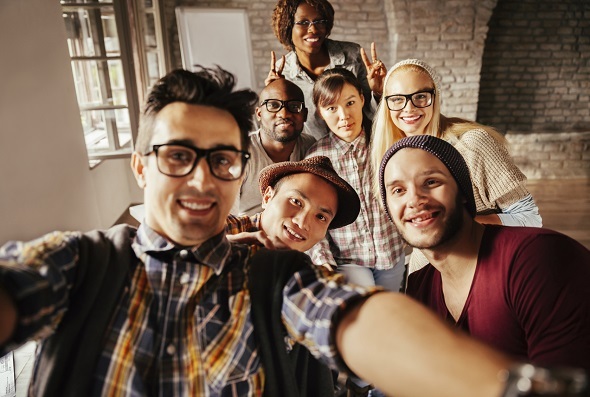 If anything, this overstates the amount of home millennials can afford, as it does not take into consideration additional closing costs, which can add up to thousands of dollars. While it is common for new homebuyers to receive help from parents and relatives to pay these additional costs, those who do not have outside help would likely not be able to afford a home at all, according to our analysis. If you’re thinking about buying a home, make sure you have enough saved. Consider meeting with a financial planner. A financial planner can evaluate your full financial situation and determine how buying a home fits in with your long-term goals. Make sure your credit score is in good shape. With a high credit score, you can get lower mortgage rates, which translates to lower monthly mortgage payments. Questions about our study? Contact us at blog@smartasset.com.